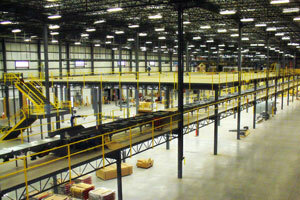 Mezzanine economics refers to mezzanine design characteristics that impact the price of the warehouse mezzanine system. Mezzanine performance refers to mezzanine design characteristics that impact the reliability and stability of the mezzanine system. First you should understand, all elevated steel mezzanine structures are designed with movement allowed. The movement we will focus on, since these are the once you may notice when standing on the mezzanine floor, will is lateral movement (sway) and deflection (deck sage or bounce). Lesser quality or lighter designed warehouse mezzanine systems will have more noticeable movement; even when all the basic detail (load rated capacity and column arrangement) look the same. This is important to understand and take into consideration when the responsibility for the purchase rest on you shoulders. At first glance all your competitive bids should look alike. The mezzanine shape and size should be the same. The requested mezzanine floor heights should be the same. The type of mezzanine deck surface should be the same. The mezzanine load rating is the same. The number of stairs and amount of handrail are all the same. By the way, these are basic detail that should be expected on all quotes. Now we get to the section of the quote you’ve been looking for. You may have even skipped all the above and went straight to it; the price. Before you make a buying decision based on price alone, you should know the following information. And, if not already provided, please ask for it. Q. What size and orientation are the mezzanine base-plates (all of them)? We recommend asking for "All of the" because it is a common practice for the supplier to state the max. base plate size. This may only be one of many smaller base plates. The base-plate is responsible for more then simply anchoring your steel warehouse mezzanine to your concrete floor. If there is excessive lateral movement at the mezzanine floor, the first possible problem is at the mezzanine base plate. Undersized base plates, offset base plates and gaps below any of the mezzanine base plates can cause excessive mezzanine movement. The mezzanine steel base-plate also helps distribute the weight of the mezzanine and the load above it. The small cost savings of smaller mezzanine base plates may be lost if you are forced to install concrete footers. It is our recommendation that the minimum base plate size should not be less then 12" x 12" x ¾" thick. The base plate should be pre drilled for no less then four properly sized anchor bolts. The anchor bolts should be specified and supplied by the mezzanine manufacture to ensure proper seismic connection. Another common base plate detail that can have a negative effect on the performance of the mezzanine floor are offset mezzanine base plates. When the mezzanine column is welded to one edge or corner of the base plate, this is an offset design and you should only accept this design when knowing it could add lateral movement of the mezzanine floor. Q. What are the sizes of the mezzanine columns (all of them)? We recommend asking for "All of the" because it is a common practice for the supplier to state the max. column size. This may only be one of many smaller columns. 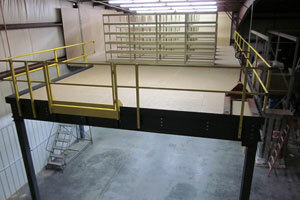 This is another area were some mezzanine manufactures can cut cost and sacrifice performance. Think about it; the mezzanine columns support all the weight. They need to react to vertical, horizontal and twisting loads. 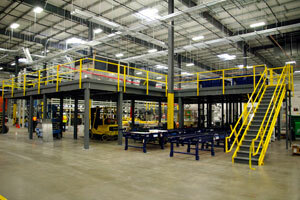 Under sizing the mezzanine columns is again another area mezzanine manufactures can reduce cost. This is one of the worst areas to cut cost. To offset this weaker design the manufacture often must use knee or cross bracing. It is my recommendation that the minimum mezzanine column size should no less then 5" x 3/16" square tube. Or that the column be sized to support the load with minimum allowable deflection without the need for additional bracing. Q. Are knee braces or cross braces being used anywhere in the mezzanine design? Knee braces and cross braces both can obstruct movement below the mezzanine. They are use by lighter designed mezzanine to minimize lateral movement of the mezzanine deck. Mezzanine knee braces are diagonal metal braces that is attached to the underside of the main mezzanine members, often 2-3 feet in from the mezzanine column. The bottom of the brace then attaches to the Mezzanine column, again approximately 2-3 feet down from the bottom of the mezzanine frame member. Mezzanine cross brace are steel "X" braces that attach to two or more columns together. Often the use of these braces is not known to the sales person. The decision to use them and what type is often in the hands of engineering after an order is placed. As the buyer, you have the right to know and choose. However you must ask or make you needs clear prior to awarding the order. Q. What type and size hardware is used to assemble the mezzanine frame structure? Believe it or not, in the interest of competing with some lower price Canadian imports, some mezzanine manufactures are replacing heavy duty nuts & bolts with sheet metal screws. We believe hardware used for framing to framing connection should be no less then three (3) ½ grade A325 bolts with nuts. Structural beam connections should be no less then three (3) ¾" grade A325 bolts with nuts. Here again, this is a cost cutting measure for the mezzanine manufacture. Screw hardware cost far less then Bolt and nut hardware. No labor is required by the mezzanine manufacture to pre-drill holes. This places a lot more responsibility on the assembly personnel to correctly install the proper size and quantity of screws in the proper location. Often these screws break off during installation due to over toque conditions. Extra care must also be taken to ensure complete metal to metal contact when the screw is fully tightened. Q. What building code is the mezzanine designed based on? First you should understand this: OSHA Standards are not a building code. OSHA Standards are occupational safety standards. You should insist that your mezzanine engineering and design be compliant on your current state building code. OSHA Standards do not meet most building codes. However, all state building codes meet and exceed OSHA Standards. Most states are now under the International Building Code IBC guidelines. The few hold outs will soon also be IBC. We recognize many end users do not apply for permits for one reason or another. Ensuring proper code compliance is important, whether you intend to pull a building permit or not. If you chose not to pull a building permit up front, having the mezzanine designed to comply with code guidelines should make the process much easier if you do so at a later time. NOT FOLLOWING CODE REQUIREMENTS LEAVES YOU VULNERABLE TO LIABILITY SUITS AND OR OTHER LEGAL ACTION BROUGHT AGAINST YOU AND YOUR BUSINESS. Q. How is the mezzanine to be shipped? Once again this is an area that the mezzanine supplier can lower their bid price with no favor to the buyer. This material is best shipped on flat bed trucks and most mezzanine manufactures do ship this way. A typical mezzanine delivery includes long, heavy bundles of steel. The longest bundle usually is equal to the longest column spacing. Loading and offloading at the site is fairly easy from the back of a flat bed with a standard fork lift truck and a sling. This is not so if the materials are delivered in a closed trailer. From a closed trailer, the materials must be pulled to the back of the trailer with a sling or chain. This can be dangerous with shifting loads and often results in some damage to the materials. It is less expensive to ship in a closed trailer and some Canadian importer find it easier to cross the boarder this way. Remember the choice is yours; but only if you ask up front. Optional specifications if available may be filled in below, or we will contact you for details.